Over 300 people from Loralai, including women and children, are protesting in Islamabad against the Frontier Corps’ (FC) encroachment and occupation of their homes. The FC has forcefully ousted these people from their homes on the pretext that the homes in which these people live were once a part of the British authorities’ territory. A protester, while talking to Hamid Mir’s programme on Geo TV, lamented the fact that despite being a part of the free country, they were being treated like pariahs. 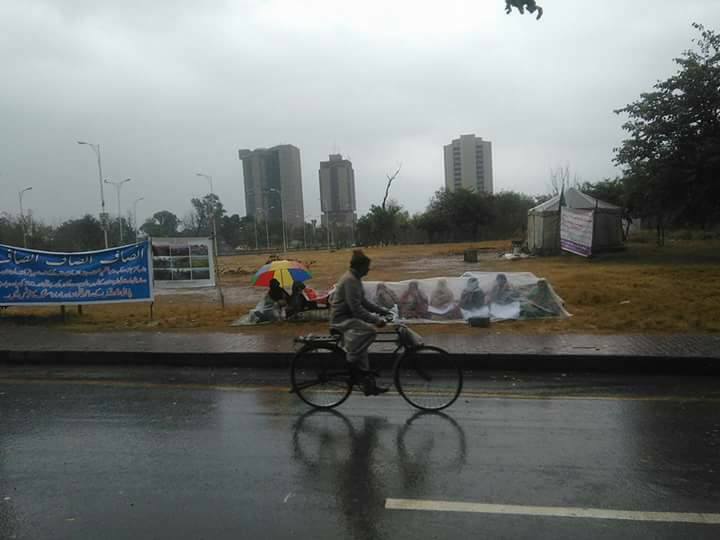 A protestor questioning Nawaz Sharif’s moral authority on the issue said that Prime Minister Nawaz Sharif says he is the proponent of truth and he expects the same from the others, but where is the PM while we [protestor] are here protesting in the rain. He also needs to listen to our version of the truth, she said.